China's massive military lead over India has never been starker. On Tuesday, amidst fanfare, Defence Minister A K Antony travelled to Bengaluru for a milestone in the development of India's 'Tejas' Light Combat Aircraft, a fourth-generation fighter that is still two years away from full service. 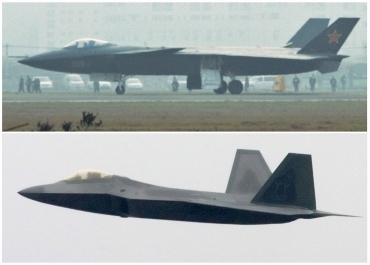 The same day, an advanced, fifth-generation stealth fighter -- so far only speculated about, as the J-20 -- made its first flight in China, heralding the arrival of what could become the world's most advanced fighter. The timing of the test is vintage China. It was conducted on the day that United States Defence Secretary Robert Gates arrived in Beijing to discuss the resumption of defence ties, which a furious China had broken off last January after America sold $5.4 billion worth of advanced weapons to 'the renegade province' of Taiwan. 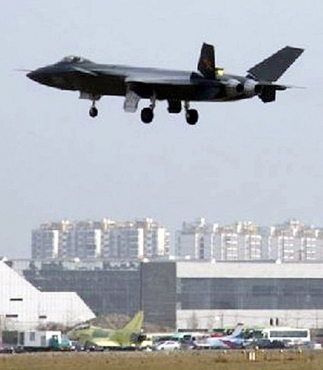 While Beijing has not acknowledged the test, on-line accounts and photographs from Chengdu, the capital of Sichuan province, indicate an advanced stealth fighter took off on Tuesday from the airfield of the Chengdu Aircraft Corporation at 12.50 pm and landed successfully an hour later. Global experts have hailed the J-20 as significantly superior to the F-35 Joint Strike Fighter, America's next fifth-generation fighter that is nearing completion. 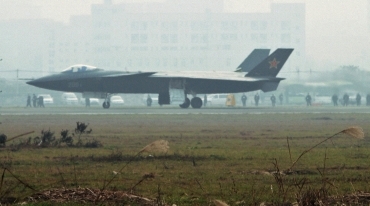 Experts say the Chinese J-20 has a stealthier design, which will make the fighter more difficult to detect by radar; larger fuel tanks that will allow it to fly almost 2,000 kilometres without refuelling; and the ability to carry more weapons, enabling it to hit long-range targets more destructively. Says Carlo Kopp, an aviation expert with think tank, Air Power Australia: "The stealth shaping is, without doubt, considerably better than that seen in the Russian T-50 PAK-FA (fifth-generation fighter) prototypes and, even more so, than that seen in the intended production configuration of the F-35 Joint Strike Fighter. 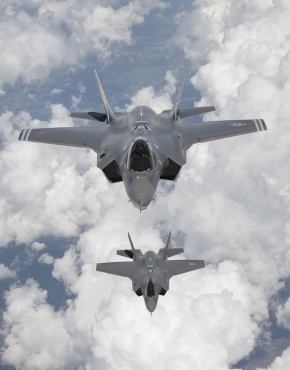 Any notion that an F-35 Joint Strike Fighter or F/A-18E/F Super Hornet will be capable of competing against [the J-20] in air combat, let alone penetrate airspace defended by this fighter, would be simply absurd." The Deputy Chief of Air Staff of the Chinese Air Force General He Weirong had declared in 2009 that the J-20 would obtain its Initial Operational Service between 2017 and 2019. Robert Gates knows that the J-20 has been designed by China specifically to target the US Navy aircraft carrier task forces that currently dominate the Pacific Ocean, off China. The US Navy's presence, close to China's coastline, has become a running irritant for the Chinese leadership. 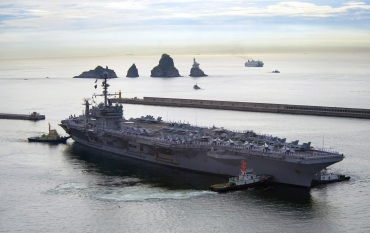 Last summer, after tension between Beijing and Tokyo, and between the two Koreas, China warned the US Navy not to enter the East China Sea to demonstrate support for Tokyo and Seoul. Washington rejected that warning. But once the J-20 enters service, China's strike power would be greatly enhanced. Experts say the size and speed of the new fighter would enable it to dominate areas far out to sea. China, which had claimed overlordship out to "The First Island Chain" -- a stretch of the East China Sea, the Yellow Sea and South China Sea that extends out to the Kurile Islands; Japan; the Ryukyu Islands; the Phillippines, and Indonesia -- has now embraced the doctrine of 'offshore defence'. Beijing now sees its exclusive preserve extend 3,000 kilometres into the Pacific, to the 'Second Island Chain', which runs along the line of Japan, the Bonins, the Marianas, and the Carolines, to Indonesia. Within this area, the J-20 would cripple a US Navy fleet by destroying its airborne control aircraft; tanker aircraft for airborne refuelling; and electronic warfare aircraft like the F/A-18G Growler. Attacks by waves of J-20s from airbases on the Chinese mainland would also shut down the US Air Force airbases in the region. While the J-20 strikes US Navy aircraft and US Air Force bases, the People's Liberation Army would employ another new 'game-changer' weapon -- anti-ship ballistic missiles -- to sink American aircraft carriers, Washington's key tool for power projection across the oceans. Given the flexibility that fighter aircraft provide as a weapons system, Beijing will easily be able to operate its J-20 fleet against India as well, by merely switching these to airfields in Tibet. Given the current capabilities of the IAF fleet, this would pose a major threat to Indian forces in Ladakh, Sikkim or Arunachal Pradesh.